If you love faceted stones, you will find this the perfect class for you. This easy style can be done on almost any shape of faceted stone including free forms. This style features a double rabbit ear bail that will accommodate an optional clear faceted stone at the top and the ability to texture your wire as well as a stable setting for your stone. You will learn how to estimate how much wire you will need and how to texture the wire if you desire. 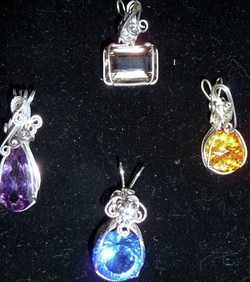 This class is all day from 10 am to 4 pm and includes all you need to complete TWO of these pendants, one wire project and 1-2 cool down projects depending on time. You are welcome to bring your own stones dependent on instructors approval. You will need to bring a lunch. Class limit is 4 students. This class is held when I get enough people to attend! Due to the difference in stones, each person will receive specialized attention to be sure the project meets their satisfaction! I will be trying to get a class going at Arts Alive soon. Call me if you would like this class so I can put you on the list and see which day we can get together! Sign up at cdedbd1@centurylink.net today! As is life, dates are subject to change!